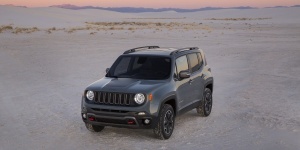 Powered by a choice of 4-cylinder engines optionally driving all-wheels, the Jeep Renegade offers excellent off-road capabilities, while seating five in a modern and quiet interior. For 2017, the Jeep Renegade receives Keyless Go across the lineup. Limited models further upgrade to keyless entry, while Latitude models come equipped with a 7-inch colorscreen as part of the Uconnect 6.5N package. Find the used Jeep Renegade of your choice from a dealer in your area. Search our used car listings now.